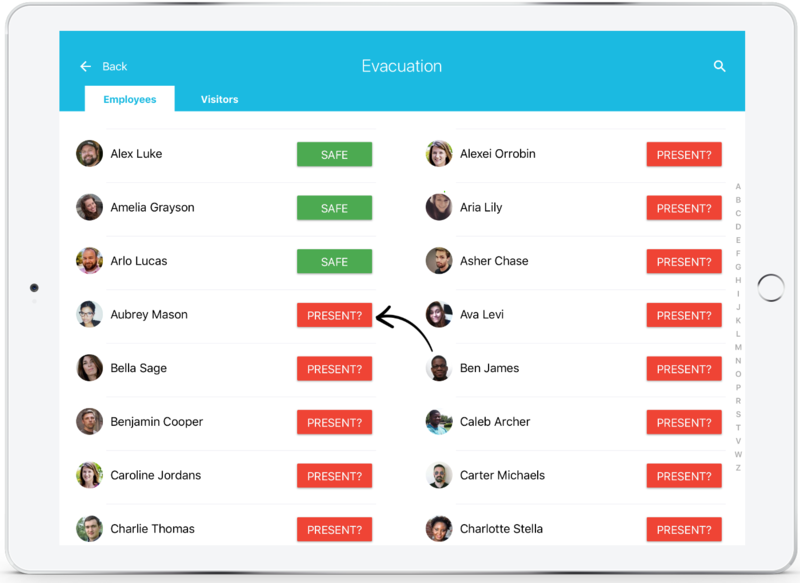 SwipedOn comes with a unique Evacuation Mode, designed to be an aid in Emergency situations and to help identify the whereabouts of staff. iPads can be removed from their day-to-day locations and be taken to muster or assembly points. Staff are then "checked off" by way of a roll call. The iPad is designed to work in an "Offline Mode", essentially taking a snap shot of all individuals who are "In" at the time of losing Wifi connectivity. Triple tap on the SwipedOn logo, positioned in the top left hand corner of the iPad. Tap on 'Evacuation Mode' or "Shake" the iPad and the 'Evacuation Mode' option will appear. Two tabs are visible, one will show all employees (if using employee in/out) and the other will show all visitors that are signed in. Employees and visitors who have signed in are automatically designated with the "PRESENT?" button. Once an individual is outside and accounted for they are marked off on the iPad by tapping on the "PRESENT?" button next to their name, the button will then change to show them as "SAFE". *Please note, SwipedOn is designed to be a useful aid, and does not constitute a replacement for your current Health and Safety Evacuation Procedures and Practices. If the wifi is out of range or intermittent at the time of 'roll call', simply turn off the wifi to ensure your system runs smoothly.